The centre of Bexhill-on-Sea is one of those rare places these days that has not become a clone town. Not being chock-full of hospitality chains and multiple retailers – they have been mostly confined to the Ravenside Leisure Park on the way out of town – it has retained an air of independence and an appearance of spontaneity. Perhaps because of this, it has gained an unfair reputation for being old-fashioned; the reality is, this is what towns are like if they don’t allow the demands of rapacious profiteering to prevail. 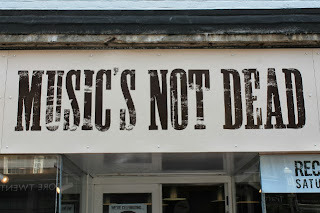 Firmly flying this flag of independence is record shop, Music’s Not Dead. 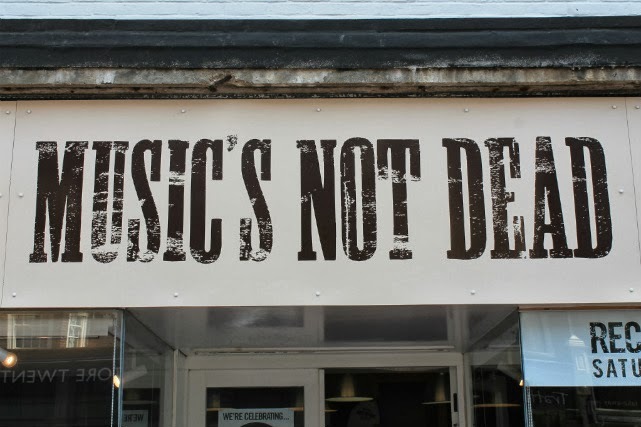 Situated at the bottom of Devonshire Road, a short shuffle across from the De La Warr Pavilion, Music’s Not Dead stocks a wide range of music on CD, including new releases and an extensive amount of artists’ back-catalogues. Prices of most discs are surprisingly cheap and there is also a large section of bargain CDs at three for £12. I did spot a vinyl section, but I didn’t go too close being an ex-vinyl junkie in remission. There is also an area where you can sit down and read music magazines. The shop was opened a couple of years ago by Del Querns and Richard Wortley and they have established a welcoming place for record rack flickers to browse and buy. And they are clearly very knowledgeable: when I visited, I picked up a copy of The Broken Family Band’s 2007 album Hello Love for a fiver (cheaper than Amazon) and was recommended to check out the lead singer’s most recent venture, Singing Adams. As an experience – be it buying a new release, coming across a forgotten album you had always meant to get or talking to people about music – it has to beat downloading tracks bent over a computer or waiting for the postman to arrive with that cardboard packet. And the best thing of all, if I had not popped into Music’s Not Dead, I would never have found out about the live music they put on: Turin Brakes are playing in the shop next Sunday, 29th September, at 4pm - and it’s free.